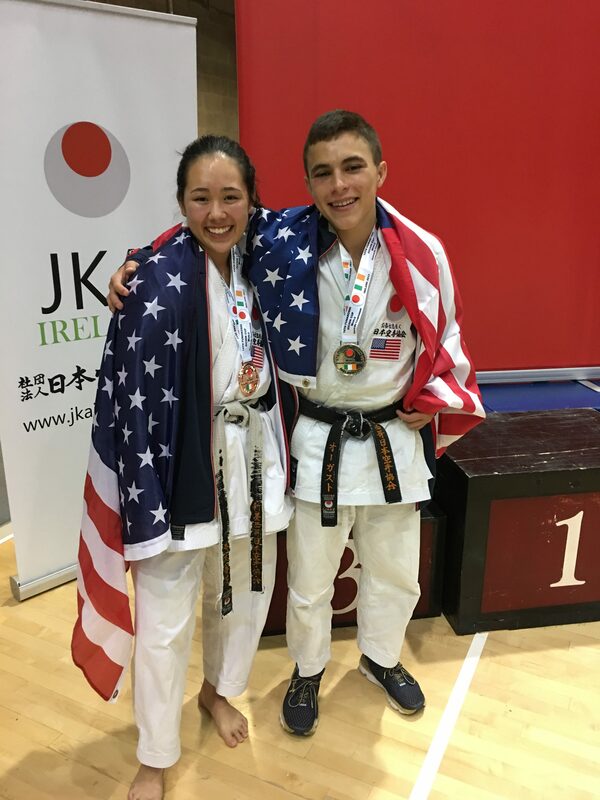 2017 JKA/WF World Cup in Ireland, Youth team medals. Emily Nagatomo World 3rd place in Sparring 16-18ys Girls. August Tierney World 2nd place in Sparring 15ys Boys. Motivation, Demonstration, Explanation, Imitation and Repetition. If you are considering enrolling yourself or your child in Albuquerque martial arts, consider going with a Sensei who has real world experience and offers the traditional Japanese approach to his Albuquerque, NM Karate lessons. Karate is much more than a method of self-defense or a physical hobby for an individual. It is an entire thought process, a way of living life as a whole. Because of the traditional approach, students can learn lessons that build integrity, self-esteem, awareness, and much more. All of our Albuquerque karate classes are located at 6501 Eagle Rock Ave. NE A-1 Albuquerque, NM 87113. There are plenty of physical benefits to be had from Karate. Albuquerque, NM families can even participate, allowing the entire family to exercise together. However, this is more than just exercise. This is mastery over the mind, body, and emotions on a level that is almost impossible to teach using anything other than martial arts. From controlling everything from breathing to the very last muscle that is put into motion, there is no limit to the physical benefits realized from Karate. Albuquerque families can testify to that fact. Because the traditional Japanese approach is used at our facility, the mind becomes as developed as the body through martial arts. Albuquerque karate students learn to excel in all things, even their homework. Success is not measured by grades or levels, but by effort and improvement as the student learns to use his or her mind to make wise choices. This ripples out to every area of their life and they learn to think things through before taking action. This includes walking away from and avoiding potentially violent situations, even if the outcome would be favorable. Karate is an excellent tool by which to build self-esteem and confidence. In part, this is because Karate does not rely on measuring status in terms of levels, but in terms of effort. There is no cookie-cutter expectation and each student excels at his or her own pace. Though our Sensei certainly supports students as they earn their belts, this is not based on physical abilities alone, and those who struggle to earn their belts realize a far greater sense of accomplishment than those who receive belts from Karate studios who do not rely on traditional methods. We offer more than just physical training in martial arts. Albuquerque karate students learn self-respect and authority over their own emotions, while also learning compassion and respect for others. We take a whole life approach so that the members of our dojo consistently use their lessons whether they are in the dojo or not. With encouragement and accountability, our students learn to make life decisions that serve a higher purpose than immediate gratification. In a world that is so utterly focused on immediate gratification, regardless of the consequences, the lessons we share have more value than ever. Students look on their Sensei as a man who gives them every reason to respect him and the lessons he shares, but they also learn to respect themselves—mind, body, and heart. These are not easy lessons for some Albuquerque karate students to learn. When you want to make sure the lessons learned are the ones that have value, turn to our dojo for your family. We will welcome you with open arms as we share centuries of time honored traditions and methods with you and your family.